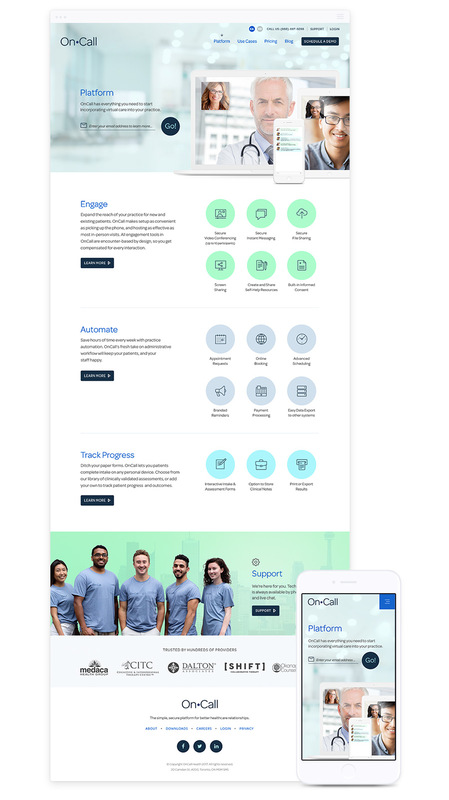 With a foot in the SaaS industry and the other in healthcare, we called on our experience to help OnCall Health evolve into a Toronto-based enterprise level healthcare technology provider. Website design with custom WordPress backend for a leading healthcare SaaS provider. 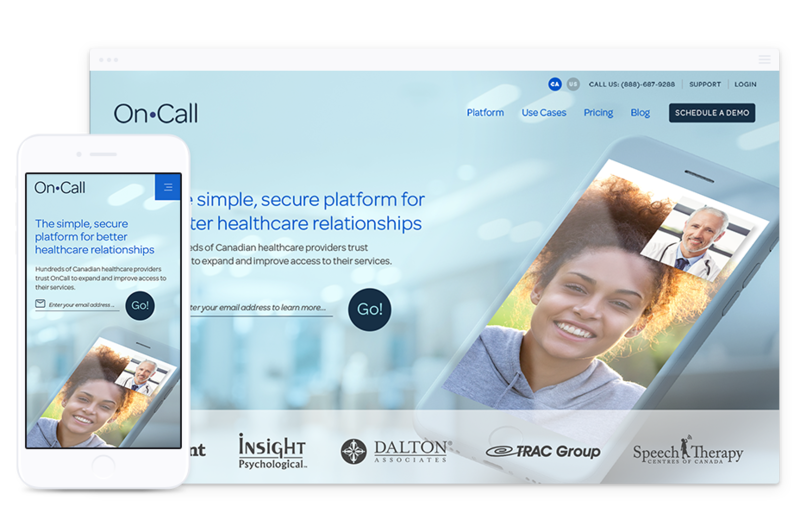 Having established themselves in the healthcare technology market, OnCall Health approached our Toronto web design company with the simple goal of taking their startup website to a much more professional level. After a short email exchange and a follow-up phone call, we submitted our website design proposal and received a quick and emphatic approval from OnCall Health. New and improved website user interface design – an essential goal OnCall Health challenged our website design company to meet was the design of a beautiful new website design interface that would propel the technology company forward and offer a more professional and confident brand. Improved lead generation and conversion strategy – one of the deficiencies of the original website were conversion rates. 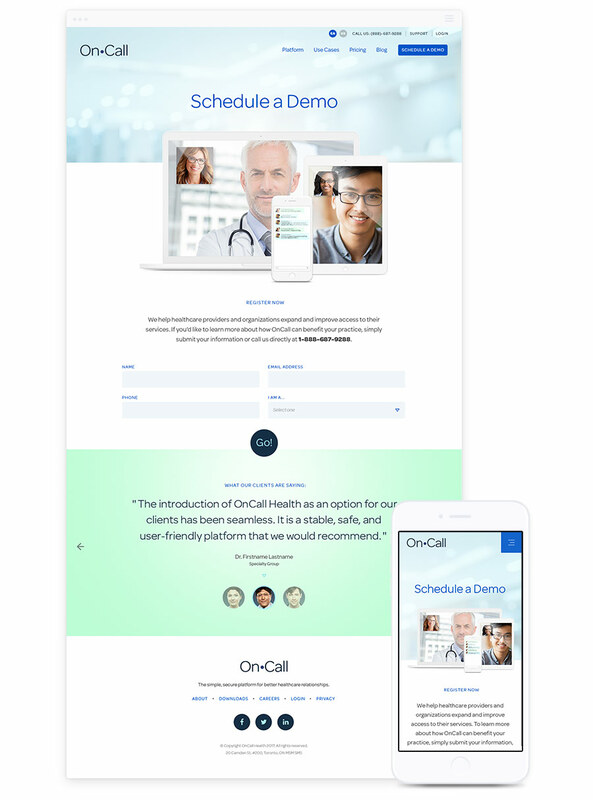 The visibility of the demo request and contact forms was unusually low making it difficult, if not near impossible for users to contact OnCall Health for more information. On-site Search Engine Optimisation – to complement the launch of the new website, our team was focused on implementing our top-notch on-site SEO to ensure the website performed as expected right out of the gate. OnCall Health was a unique and exciting client for our Toronto web design team in that they straddled the line between two of our most common client types. For more than a decade, Parachute Design has specialised in professional website design for healthcare organisations and technology companies alike. In this scenario, our client had a foot in both industries. Relying on our experience in both these sectors, we kicked off our discovery and strategy phase with OnCall Health. Step one found us sharing our famous website design questionnaire with our new client. The strategy document is designed not only to collect information about our clients and their vision but also to get both teams working together and having some fun with some of the silly questions designed to lighten the atmosphere as well as subtly draw out design direction we’ll need to focus on later. Following our questionnaire and discovery, we analysed the existing website analytics to gain insight into not only who was using the current website, but how they were using it, what information were they seeking and what devices or environments were they using to experience the website. All of this initial discovery work made way for our web design strategy phase, which first saw the development of the revamped sitemap to improve the navigational experience on the website and encourage users to digest more information before prompting them to engage via one of several conversion avenues. Next on the path to a beautiful new website design was wireframing. During this phase, both our website design and web development teams work together to establish the new page layouts and information architecture without the distraction of a polished design. This exercise helps our clients understand the makeup of the critical pages of the website on a fundamental level and illustrates how our conversion strategy will work as users navigate from page to page within the website. Following the completion of our website strategy phase, our creative team of web designers took the research, competitor analysis, sitemap and wireframes and began to develop the website design concept. Seamlessly weaving together our strategy and our clients feedback from the initial questionnaire, the website design began to take an exciting new form that immediately commanded attention and illustrated what OnCall Health offered and how customers will go about requesting a product demonstration. Through the use of custom icon design and photography, our website design team merged the soft, comforting colour palette users expect from a healthcare setting with subtle design elements that helped illustrate the technology component to the service offering. To manage project timelines and ensure a seamless development process we often begin backend WordPress website development during the creative web design phase. While our web designers are working away with the polished user interface, the backbone of the new website is quietly coming together. With full approval from OnCall Health, our website development team joined the fray and dove right into the development of the brand new responsive user interface design. The front user interface would eventually find a new home over top of the custom WordPress content management system. With the use of advanced custom fields, our web developers were able to create an intuitive CMS for OnCall Health’s website administrator to rely on for day-to-day website management. In addition to a neat and tidy backend, we also included handy features that allow the OnCall team to easily drag and drop assets and content to reorder or manipulate content on the fly. During the final web development stage we call pre-launch, our content entry specialist combed through the website content to ensure that all of our on-site search engine optimisation was in order and ready for launch. For sixty days following the launch of the new website design, our team supported the website as it made its place in the wild. As a web design team, we feel it essential to ensure that all websites we create and deploy are supported for two months while our clients fully experience them and learn more about managing a website on a daily basis. Additionally, as the web is continually evolving, we believe it’s crucial to be able to adapt to new software or security threats as they arise to ensure our clients business is moving forward. For more than 14 years Parachute Design has been at the forefront of the Toronto website design industry. Our depth of experience creating website design for technology companies and healthcare organisations across Canada and abroad offers value to our clients that ensure our relationships are long-lasting and fruitful. If you are interested in our responsive website design services or to inquire about a web design quote for your business, please complete our proposal planner or contact our Toronto web design company at 416-901-8633. Are you considering a new website design or planning a new logo and brand refresh? We can help you create a project plan to ensure your project is successful and done right the first time.